While the Daiquir-ease is a broad interpretation of what one might call a 'daiquiri,' it is an excellent cocktail. 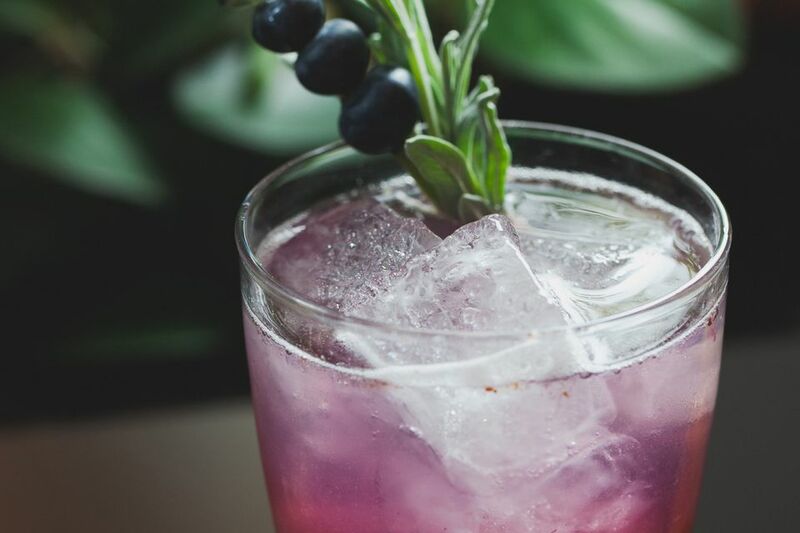 It gives you the opportunity to make two mixers from scratch: a lavender-infused honey and a blueberry-flavored shrub. The Daiquir-ease is certainly a fun cocktail and one that will appeal to your DIY side. Both homemade ingredients are very easy to make and you will find the recipes below. While you have them in your bar, try them out in other cocktails as well. You will be surprised at just how useful they can be as well as the beauty of the blueberry and lavender pairing. Beyond the mixers, the drink is very simple and features a fantastic rum from Zacapa. Their Zacapa Rum 23 is a blend of rums aged anywhere from 6 to 23 years and it is a very nice sipping and mixing rum. Pour the rum, shrub, and honey into a cocktail shaker with ice cubes. Strain into a chilled highball glass filled with ice. Garnish with lavender and a lime wheel. The lavender honey is very easy to make and this recipe takes a different approach to the typical lavender-flavored syrup. Instead of using fresh or dried lavender buds, it mixes a brewed lavender tea (technically an herbal tisane) with equal parts honey. It's a very simple way to get nearly the same taste, though it's important to note that many 'lavender teas' are not solely lavender. If you buy it in tea bag form, you might also get some green or black tea or other herbs like chamomile included in the mix. This is not necessarily a bad thing, it will only add to the flavor. For a pure lavender tisane experience, simply steep whole lavender buds in hot water using a mesh tea strainer or fill-your-own tea bag. To make the lavender honey, brew 1 cup of lavender tea. Combine this with 1 cup honey and stir until well mixed. The blueberry shrub is a fun flavored drinking vinegar that is quite easy to make. This one begins with fresh berries and apple cider vinegar and you will need to give it at least 2 days for the flavors to infuse. When your shrub is done, you will be ready to mix up the Daiquir-ease. You can also use it in other cocktails to add an interesting twist. Any shrub can be enjoyed on its own as well and this one is fantastic with club soda or ginger ale. In a jar with a tight-sealing lid, place 1 cup of fresh or frozen blueberries into 1 1/2 cups apple cider vinegar. Cover, shake well and let sit for 2 days. Give the jar a good shake at least once a day. Taste the shrub and infuse for longer if needed and until you get your ideal blueberry flavor. Once that is done, strain out the berries. Place the shrub into a small saucepan and gently heat (do not boil). Turn off the heat and add 2 tablespoons of agave nectar, mixing well. Taste and add more nectar if you like though keep in mind that you do want a certain amount of bitterness. Allow the shrub to cool and store in a well-sealed bottle. How Strong Is the Daiquir-ease? The Daiquir-ease is a very mild and lovely cocktail and it's one that you can enjoy anytime without fear of getting too loopy. The majority of the drink is made with non-alcoholic mixers, so it has an alcohol content of just around 11 percent ABV (22 proof).